Fact: Your new product replaces an older technology. It will cost less to operate, is quicker, and provides more information. The price is $30K. There are 200 labs in your territory doing it the old way. If your product really does save money and/or time, why doesn’t every site buy one? 1. Many salesreps don’t understand what problem their product is solving. If you don’t know what to believe in, your prospects won’t either. Remember, they have seen too many promises of money/time savings before, and must sense your enthusiasm and conviction to commit themselves. Also, companies today are looking closely at what they purchase; your prospect will stick their neck out only if they feel it will do the job, and make them look good in the process. 2. Your prospect might be in an environment that waits for new technology to mature into old technology before they buy. Just look around your prospect’s laboratory before you place them on your forecast. Keep coming back to them, because eventually they’ll buy your aging, mature technology, which could make your month. 3. Competition is selling another mousetrap. If you’re losing sales, it’s most likely because you’re getting beat. Are they outrunning you, or are they solving more customer problems than you are? Even an inferior product solves problems! 4. You’re not organized. If you need to deliver fifty pizzas to fifty locations before they get cold, you’d plan it, wouldn’t you? Your territory is the same way. Get to the opportunities before they get cold, and you’ll get your share of the business. What’s The Plan? : Remember, there must be a need, even if they don’t see it. If you really think your product can save them time and/or money, it is your selling responsibility to educate them. Don’t let them off the hook; they’ll thank you later on. If your product cost $30K show them how it will pay for itself. Let’s use this example:Assume a product cost $30K. It is 4x faster than their current procedure. Today, they spend $1.00/sample. Your system cost $0.25/sample. They do 10 samples per day (spd). They presently spend 4 hours per day (hpd), hands-on, processing these 10 samples. Your system would take 1 hpd hands-on. How do you figure the cost and savings? You get this info from your customer, who probably won’t tell you about repeats and outlyers, unless you ask them. The more you understand their application, the better you’ll get at judging numbers. A lease for a $30K system at 10% runs about $980/month. Over a twelve month period they will spend $11,760 (tax deductible) and still save $4,440/yr. ; over three years $13,320! That’s real dollars, assuming you believe it, and have enough proof. Selling a system which has a financial argument can be the easiest sale around, but you’ve got to have your stuff together. If your company doesn’t provide this training, call us! If your career is selling, invest in yourself, and the return will pay for itself many times over. Assume some days w/o samples. With ‘right sizing’ becoming the corporate fight song, labor savings are very popular. 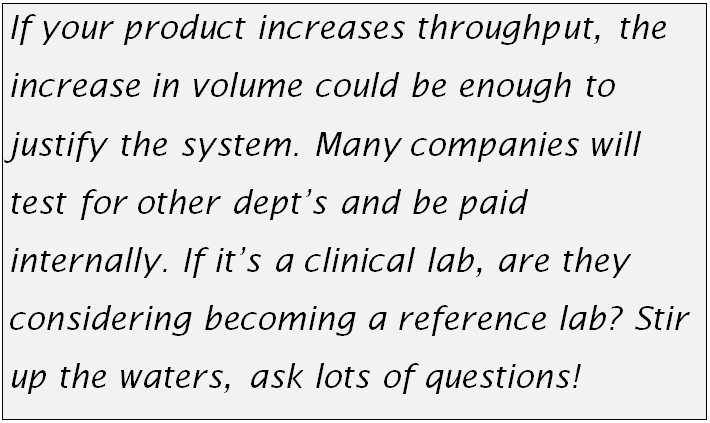 This calculation doesn’t measure: positive effect of increased sample volumes; reduction in training time if the product is easy to use; reduction of hazardous material disposal & handling; the value of new info that could reduce project time, solve a major problem (sometimes new information opens up a can of worms, i.e., the discovery of more peaks in a chromatogram using a new detector, suggesting contamination), or getting their product to market quicker?